From drug development and product design to medical education, marketing, reimbursement and patient adherence, behavioural science can be applied to inform and improve outcomes all round. In the latest edition of Deep Dive: Future Pharma, Complete HealthVizion’s Robert Poole and McCann Health’s Sandra Gulbicki argue that a behavioural mindset should be applied to every health care communication, large and small. But to what extent has pharma bought in to the idea? Communications often fail simply because they are not based on an understanding of human behaviour, drivers of decision making and social nuances. 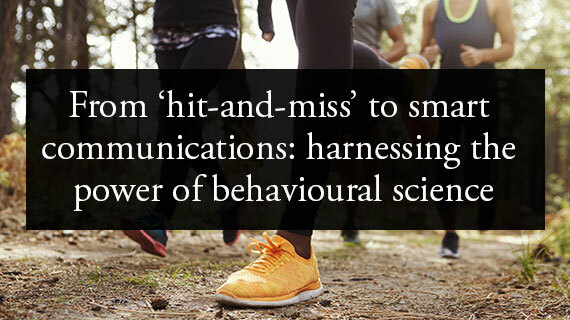 Behavioural science provides a framework to develop smarter communications and drive better health outcomes. Public health campaigns and adherence programmes are only the tip of the iceberg: all communications can benefit from behavioural science. As a foundational element of communications, behavioural science should be fully embedded across organisations and in an overall approach to communications, not just an ‘add-on’.